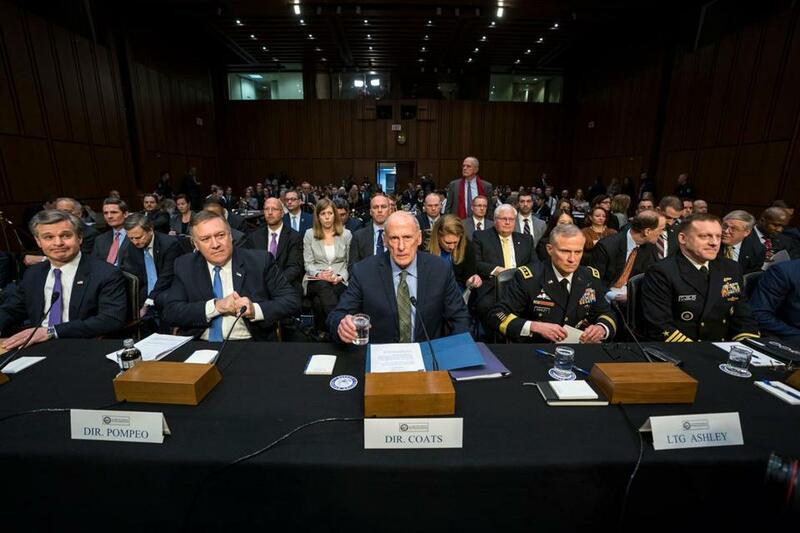 The nation’s top intelligence officials, led by director of national intelligence Daniel Coats (center), addressed the Senate Intelligence Committee on Tuesday. WASHINGTON — The nation’s top intelligence chiefs were united Tuesday in declaring that Russia is continuing efforts to disrupt the US political system and is targeting the 2018 midterm election, following its successful operation to sow discord in the most recent presidential campaign. Their assessment stands in contrast to President Trump, who has repeatedly voiced skepticism of Russian meddling in the 2016 election. At a Senate Intelligence Committee hearing on worldwide threats, Democrats demanded to know what the intelligence community is doing to counter Russia’s actions and whether Trump has given explicit directions to them to do so. ‘‘We cannot confront this threat, which is a serious one, without a whole-of-government response when the leader of the government continues to deny that it exists,’’ said independent Senator Angus King of Maine. The disconnect between Trump and his most senior intelligence advisers has raised concerns that the US government will not be able to mount an effective plan to beat back Russian influence operations in the upcoming midterm election. And Daniel Coats, director of national intelligence, said there is ‘‘no single agency in charge’’ of blocking Russian meddling, an admission that drew the ire of Democrats. ‘‘The fact that we don’t have clarity about who’s in charge means, I believe, we don’t have a full plan,’’ said Senator Mark Warner, Democrat of Virginia, the vice chairman of the committee, which is conducting an investigation into Russian interference in the 2016 election. Coats said that Russia will continue using propaganda, false personas, and social media to undermine elections. ‘‘There should be no doubt that Russia perceives its past efforts’’ to disrupt the 2016 presidential campaign ‘‘as successful and views the 2018 midterm elections as a potential target for Russian influence operations,’’ said Coats, the leader of the US government’s 17 intelligence agencies. His assessment was echoed by all five other intelligence agency heads present at the hearing, including CIA Director Mike Pompeo, who two weeks ago stated publicly that he had ‘‘every expectation’’ that Russia will try to influence the coming election. The intelligence community’s consensus on Russia’s intentions led Senator Jack Reed, Democrat of Rhode Island, to press officials on whether Trump has directed them to take ‘‘specific actions to confront and to blunt’’ Russian interference activities. FBI Director Christopher Wray said the bureau is undertaking ‘‘a lot of specific activities’’ to counter Russian meddling but was ‘‘not specifically directed by the president.’’ And Pompeo added that Trump ‘‘has made very clear we have an obligation’’ to make sure policy makers have a deep understanding of the Russia threat. Coats also said the intelligence agencies ‘‘pass on to the policy makers, including the president,’’ relevant intelligence. Earlier in the hearing, Pompeo said that the intelligence community has offensive ‘‘capabilities’’ to ‘‘raise the costs to adversaries’’ seeking to hack into election systems. He took issue with King’s suggestion that the US government has not taken actions to deter adversaries in cyberspace. ‘‘Your statement that we have done nothing does not reflect the responses that, frankly, some of us at this table have engaged in — that the US government has engaged in — both during and before this administration,’’ Pompeo said. King, citing the nuclear doomsday movie ‘‘Dr. Strangelove,’’ said, ‘‘deterrence doesn’t work unless the other side knows’’ about the weapon. The intelligence chiefs also said that North Korea’s presence at the Olympics in South Korea, which saw a historic visit by North Korean leader Kim Jong Un’s sister, had not changed the intelligence community’s assessment that the regime is trying to build nuclear weapons to threaten its neighbors and the United States. ‘‘The decision time is becoming ever closer in terms of how we respond’’ to North Korea’s weapons development, Coats said. Pompeo said his agency has completed an analysis of how North Korea would respond to a US military strike, as well as what it would take to bring the regime to the negotiating table. He offered to describe that analysis only in a closed, classified session. Pompeo also responded to reporting last week by The New York Times and the Intercept about an intelligence operation to retrieve classified National Security Agency information believed to have been stolen by Russia. The Times reported that US spies had been bilked out of $100,000, paid to a shadowy Russian who claimed to be able to deliver the secrets as well as compromising information about Trump. Pompeo categorically denied that the intelligence agency had paid any such money, directly or indirectly. He claimed that the newspaper had been duped by the same person trying to sell the US government bogus information. At the end of the hearing, committee chairman Richard Burr, Republican of North Carolina, said that the panel hoped to release publicly the findings of its Russia investigation ‘‘before the primaries begin’’ in March. Their probe includes a review of the intelligence community’s January 2017 assessment on Russian interference, he said. That assessment concluded that the Russians wanted to help get Trump elected.